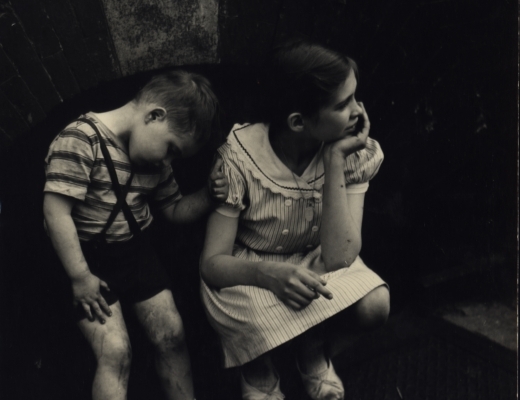 Steven Kasher Gallery is pleased to present Sandra Weiner: New York Kids, 1940-1948. The exhibition features over 20 rare vintage black and white prints, many exhibited for the first time. Weiner’s photographs are celebrated for their perceptive depiction of everyday life in New York City's close-knit neighborhoods of the 1940s. Her photographs of children at play create a palpable sense of place. Weiner’s photographs reveal random moments of grace, transforming social documentation into a broadly humanist mode of street photography. Her sensitive and subtle renderings of neighborhood atmosphere make her photographs of New York heartwarming. Also on view is the exhibition Dan Weiner: Vintage New York, 1940-1959. This is the first time that exhibitions of the husband and wife photographers have been on view concurrently. Weiner focused on New York’s poorer children, possibly because she identified with them but more so because she wanted to tell a story of perseverance and hope. Weiner’s work highlighted social concerns of the era, however she focused her lens specifically on the city’s youngest denizens. 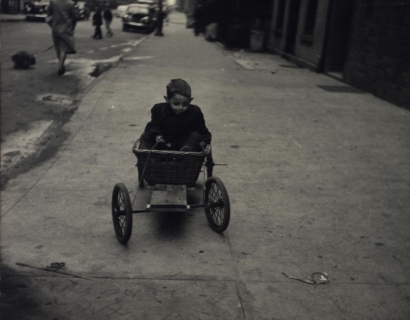 For Weiner, children surviving the rough-and-tumble city streets became a symbol of fortitude. She strolled the city’s streets or posted at the edge of vacant lots where children play and caught them absorbed in their own worlds. Included in the exhibition is an extended essay in which Weiner followed a young boy named Mickey through his daily life in the tenements of East 26th Street. This is Weiner’s work at its most penetrating. Through this extended study, defining aspects of the boy’s life are revealed. The subtle details that emerge in these images give us a clear sense of the family’s hardship. However the young boy’s palatable joy and energy shines through, triumphing over his circumstances. It was through her experiences with the Photo League that Weiner was exposed to other female photographers. The League was a rare entity at the time. Although there are no official records, there were thought to be at least 100 women who were closely involved, if not full members. 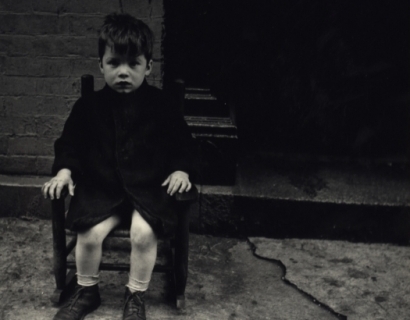 Among them were Lisette Model, who later taught Diane Arbus and Larry Fink, and Berenice Abbott. Being a photographer allowed Weiner the opportunity to place herself within the primarily male field of art. The democratic nature of the Photo League gave Weiner the ability to have an imprint and make a difference. Sandra Weiner (1921-2014) was born in the town of Drohiczan, Poland and immigrated to the United States in 1928. She met the photographer Dan Weiner in 1940 and took photography courses from him as well as from Paul Strand at the Photo League. She and Weiner were married in 1942. In 1947 she began working with her husband on his freelance assignments for Fortune, LIFE, Sports Illustrated, Harper's Bazaar, and other publications. They continued collaborating until his death in in 1959. Sandra Weiner worked as one of the earliest picture editors for Sports Illustrated Magazine. Weiner published four children’s books, illustrated with her own photographs, It's Wings That Make Birds Fly (1968), Small Hands, Big Hands (1970), They Call Me Jack (1973), and I Want to be a Fisherman (1977). Weiner taught photography at New York University and at the City University of New York. Her work has been exhibited at the Akron Museum of Art and the Port Washington Public Library. Sandra Weiner: New York Kids 1940-1948 will be on view June 7th-July 27th, 2018 at Steven Kasher Gallery, located at 515 W. 26th St., New York, NY 10001. Gallery hours are Tuesday through Saturday, 10 AM to 6 PM. For more information about the exhibition and all other general inquiries, please contact Cassandra Johnson, 212 966 3978, cassandra@stevenkasher.com. Sandra Weiner: New York Kids, 1940-1948 is included included in a roundup of Editors' Picks for must-see shows this week. L'oeil De La Photographie features SKG's current exhibition, Dan Weiner: Vintage New York, 1940-1959 and Sandra Weiner: New York Kids, 1940-1948. These shows will be on view through July 28.